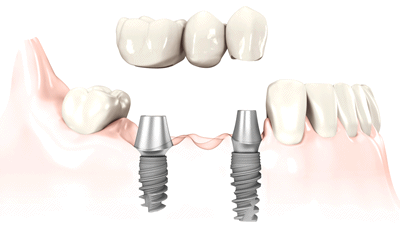 Replacing multiple teeth using dental implants with individual crowns or with an implant-supported fixed bridge gives your teeth a level of fit, feel and functionality that is not possible with other treatment options. The process is often completed over multiple visits. Placement of a fixed, implant-supported bridge, or custom-made replacement teeth (crowns).The new bridge will handle all the pressure that your strong, natural back teeth did. You will have a stable and secure solution that allows you to eat what you want.